This month I’m proud to say that I’ve written a feature for the very first issue of the fabulous new national wedding magazine, Inspired Bride. The magazine is edited by the awesome Rachael D’Cruze-Sharpe, who was my very first media boss when I joined Future Publishing way back in 2009 (seems like a lifetime ago…), so when she got in touch about writing for her latest venture I couldn’t wait to get involved. My piece is about picking a wedding photographer, a tricky task for many couples. I spoke to a variety of fantastic wedding photographers (some of whom I’m fortunate enough to know in person) so we could feature some of their fantastic work. 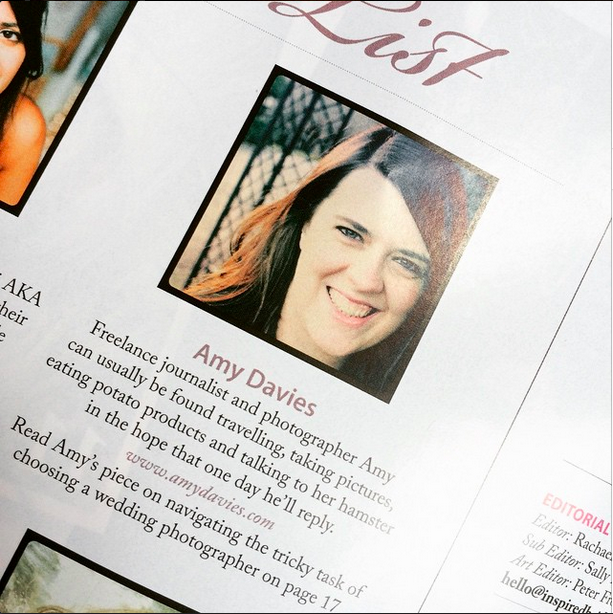 The resulting feature is four pages of design loveliness, and is finished off with a checklist of what to ask your wedding photographer before your big day. I had a lot of fun writing this piece, and it made a nice change to write something which is photography related, but wasn’t a camera review – it was a nice challenge to get stuck into a long form feature of this nature, too. Even though my feature count for online publications in the thousands by now, there’s something a little special about receiving a hard copy of a magazine that you can hold in your hands (I love online too, just in a completely different way…). In the front of the magazine, I even made it on to the “guest list” – with this photo of me which I don’t completely hate taken by my friend Rob (kudos to him for accomplishing that). The issue is out to buy in the shops now. What I love about it is that it’s not like the majority of other indentikit wedding magazines currently on the market – there’s no £25,000 venues and dresses, it’s about normal couples with normal budgets. I’d recommend it to you even if you’ve been put off by traditional wedding magazines before. Next month, I’m equally as excited to say that I have another feature in the magazine, about the perils of asking someone you know to be your photographer. See below for some screengrabs of how the feature looks.